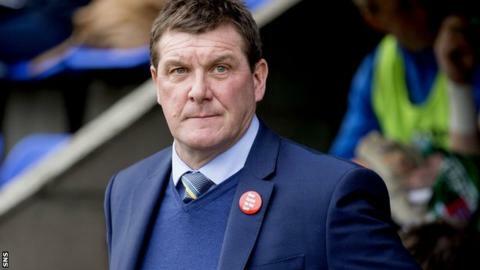 St Johnstone manager Tommy Wright says the competition for places among his strikers is driving the club's goal-scoring exploits in the league. Saints are second top scorers in the Premiership behind Celtic, having found the net on 27 occasions in 13 matches. Last season the Perth side managed just 34 goals in the entire campaign as they finished fourth in the table. "It is a remarkable turnaround when you consider last season," Wright told BBC Scotland. Graham Cummins, John Sutton, Steven MacLean and Michael O'Halloran have all chipped in with goals this season, as have midfielders Liam Craig and David Wotherspoon. "[Competition] has driven people on to make sure they are at their best in every game," Wright said. "It is the first time really since I have been at the club we have had four really good strikers. "I think in terms of how we play we are getting good delivery in wide areas and maybe we are a little bit more expansive in how we play." Wright believes the team have learned how to win matches in different ways, but the increase in the goal count is certainly helping his team. "Most teams who only score 34 goals in a season would be at the wrong end of the table," the Saints boss explained. "We have proved there are many ways to win football games. From my point of view, I would like more clean sheets as well this season and maybe we would be even higher in the league, but I can't complain too much. "We are in training probably doing more crossing and finishing than maybe we did last year, but I think the main thing is there is a healthy competition for places." St Johnstone have been criticised by a small section of their support for the lack of development in youth players at the club, but Wright says this issue is now being addressed. "We are now starting to bring young players through but it will be a slow process as we we started of from a low base," he said. "We have 10 out on loan at the minute, which is unheard of for St Johnstone. When they come back they have got to everyday keep their standards up and play at a level when they get opportunities that keeps them in the team. "I have a bottom line. If they are good enough they will play in the first team. They have to be better than the senior player and that is the basis I pick the team on." Wright was a spectator in the stand at Easter Road watching Championship side Hibernian comfortably beat Premiership Dundee United in the League Cup. And he feels it may be time to once again examine the prospect of an expanded top division, arguing that both Hibs and second tier leaders Rangers would hold their own against Scotland's top clubs. "If you look at the size of those two clubs I believe they are Premiership clubs playing in the Championship," Wright added. "It would be unfair to class the whole of the Championship like that but teams like Falkirk are also doing extremely well. 'I don't know what the budgets are but I would imagine they would be higher than a lot of teams in the Premiership are. "Certainly Rangers are and imagine Hibs is as well. That allows them to attract good players and put together squads that probably proves there is not much of a gap."